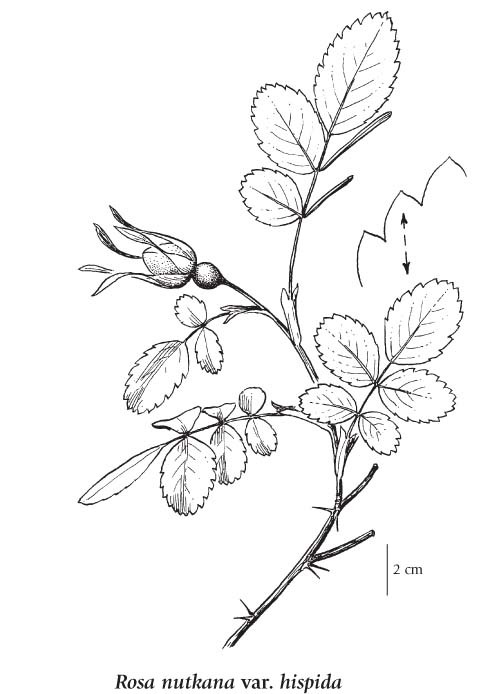 Medium to tall shrub 0.5-3 m tall, spreading by rhizomes and often thicket-forming; stems stout to spindly, erect to arching, with a pair of large prickles (thorns) at each node, usually lacking internodal prickles; mature stems blackish. Alternate, deciduous, odd-pinnately compound, the leaf-stalk and axis glandular-hairy or short-hairy; leaflets 5 or 7 (9), elliptic to egg-shaped, 1-7 cm long, coarsely single- or double-toothed, somewhat glandular-short-hairy beneath; stipules usually glandular-blunt-toothed. Inflorescence of usually single, sometimes 2 or 3, stalked flowers on lateral branchlets; corollas pink, saucer-shaped, large (4-8 cm across), the petals 5, (2) 2.5-4 cm long; calyces smooth or glandular-bristly, 5-lobed, the lobes lanceolate, 1.5-4 cm long, long-tapering and narrowing then flaring below the tip, persistent; ovaries superior but enclosed in the urn-shaped floral tube (hypanthium); stamens numerous. Achenes, numerous, stiffly long-hairy on one side, enclosed by the fleshy hypanthium, which ripens into a purplish-red, globe- to pear-shaped hip 1-2 cm long. 1. Leaflets singly saw-toothed, the teeth not gland-tiped; prickles rarely enlarged and flattened; plants mostly from east of Coast-Cascade Mountains..................var. hispida Fern. Mesic to moist thickets, forest edges, river terraces, shorelines, streambanks, clearings and roadsides in the lowland and montane zones; common throughout BC south of 55oN except in the Chilcotin area, infrequent northward, absent in NE BC; N to AK and S to CA, CO and UT. Aboriginal people in the Pacific Northwest traditionally used this species as a food, medicine, and source of cultural material. The methanolic extract of the fruits of R. nutkana has been found to have inhibitory activity against methicillin-resistant Staphylococcus aureus (MRSA). Jovel, Eduardo M., Xi Ling Zhou, Dong Sheng Ming, Tanya R. Wahbe, and G.H. Neil Towers. 2007. 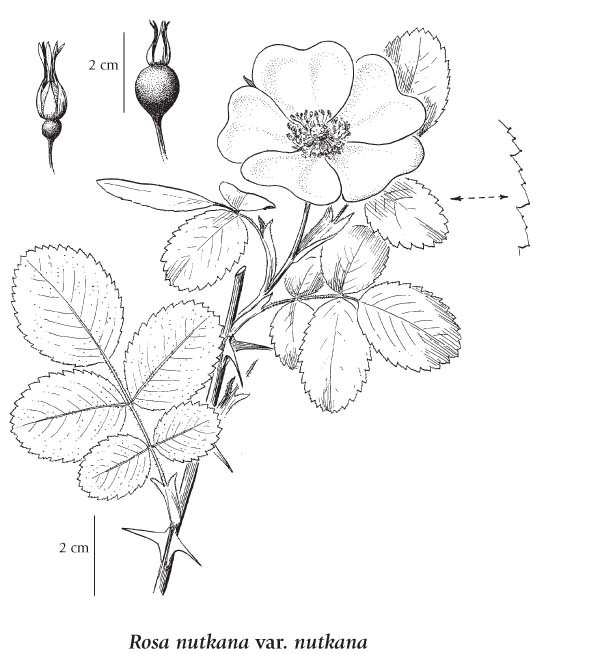 Bioactivity-guided isolation of the active compounds from Rosa nutkana and quantitative analysis of ascorbic acid by HPLC Canadian Journal of Physiology and Pharmacology 85(9): 865–871. A shade-tolerant/intolerant, submontane to montane, Western North American deciduous shrub distributed more in the Pacific than the Cordilleran region. Occurs on fresh to very moist, nitrogen­rich soils within boreal, cool temperate, and cool mesothermal climates. Most frequent on floodplains; sporadic in non­forested communities and open-canopy forests on water­shedding sites with fluctuating groundwater tables. Occasional on sites affected by ocean spray and brackish water. A nitrophytic species characteristic of Moder and Mull humus forms.